The Stables - Milton Keynes - Milton KeynesGyles Brandreth: Break a Leg! Theatre Royal Winchester - WinchesterGyles Brandreth: Break a Leg! Bath Komedia - BathGyles Brandreth: Break a Leg! Arlington Arts Centre - West BerkshireGyles Brandreth: Break a Leg! Epsom Playhouse - EpsomGyles Brandreth: Break a Leg! Landau Forte College - DerbyGyles Brandreth: Break a Leg! Redgrave Theatre - BristolGyles Brandreth: Break a Leg! Leicester Square Theatre - LondonGyles Brandreth: Break a Leg! Harrow Arts Centre - MiddlesexGyles Brandreth: Break a Leg! Warwick Arts Centre - CoventryGyles Brandreth: Break a Leg! The Old Rep Theatre - BirminghamGyles Brandreth: Break a Leg! Shrewsbury Theatre Severn - ShrewsburyGyles Brandreth: Break a Leg! Hertford Theatre - HertfordGyles Brandreth: Break a Leg! Broadway Theatre Letchworth - Letchworth Garden CityGyles Brandreth: Break a Leg! They say all political careers end in tears. 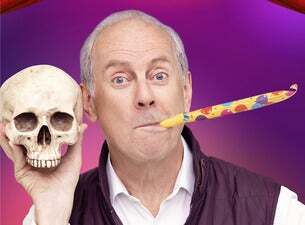 In Brandreth's case it's tears of laughter as the actor, author, ex-MP, One Show reporter and QI, Have I Got News For You and Countdown star is heading back out on tour with his new show, Break a Leg!, celebrating all things theatrical. Without hesitation or repetition (and just a touch of deviation), Just a Minute regular Gyles delivers a dazzling hour of wit, wisdom, high drama, low comedy and hilarious name-dropping.